Book a Barbados holiday and you'll be whisked away to the most easterly island in the Caribbean. 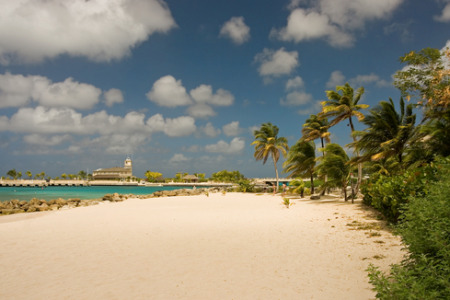 Part of the Lesser Antilles, and measuring only twenty-one miles by fourteen miles, Barbados boasts some of the best beaches in the Caribbean. Think 'castaway', think Swiss family Robinson', and you'll begin to get the idea of the calibre of the western beaches. Gently caressed by the Caribbean Sea they contrast sharply with those on the eastern side that are bombarded by the mighty Atlantic. This side of Barbados attracts surfers looking for an adrenalin rush as they ride the rollers. The east however is where the majority of visitors go. This rather small, flat coral island is home to many luxury hotels and superb restaurants. Whatever you choose, be it a small hotel or an all-inclusive complex, you'll find that standards are high and service is excellent. Where ever you go, you can be assured of a warm, friendly welcome. Home from home or maybe not. You'll feel quite at home as you look around at the place names, until of course you look at the tropical beaches and the brilliant blue of the seas. With the water temperature almost the same as the air temperature, bathing is an absolute pleasure. No sharp intake of breath as you enter this sea. Cheap Barbados holidays are most popular between the months of October and July, thus avoiding the worst of the rain and, more importantly, the hurricanes. They appeal to anyone seeking great beaches and guaranteed sunshine, no matter what their age. Even though the island is small, visitors can enjoy numerous recreational activities. Shopping is great and nightlife can be found that suits any mood. Find your cheap Barbados holiday today. If you are tempted by a cheap Barbados holiday but can't face the arduous task of trawling through web page after web page trying to find the best deal, try our simple search facility. You'll find over three dozen travel companies competing for your custom. It is simple to use and remember, competition brings out the best bargains. Our search facility enables you to see, at a glance, the Barbados holiday that is the cheapest, and the one that offers the best value for money. All you have to do to secure the holiday is make a phone call. To book the best deal, and to avoid disappointment, ring today. Where are the Best Adult Holiday Destinations? - we've chosen some of the very best holiday destinations for adults.